Stumble across "bad food?" We've all done it. This is a great natural product to bring on all travels. 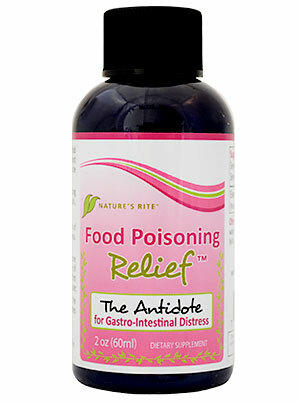 Food Poisoning Relief™ is packaged in a convenient pouch of four 2-ounce bottles. Each bottle provides two doses and is small enough to be thrown into a purse or other carry-on baggage. Polysorbate 20 and Peppermint Oil (less than 1%) to enhance effectiveness. I have been practicing holistic medicine for 38 years, and am always researching for products that work. Your product Food Poisoning Relief™ is one such product. In fact, it qualifies as a magic bullet. Several months ago I had invited a friend to have dinner. The friend called an hour before to cancel because she had vomiting and diarrhea. I told her that I had something for her to try. She came over, drank one bottle. I now recommend that my patients purchase the four-bottle package so they have it at all times, especially when they travel. — Dr. Abram Ber, M.D. I flew home from Europe yesterday was home for a few hours all the sudden felt hot starting passing lots of gas and over all lousy. I did use the nasal spray on the plane. Thinking this was from food, I went right to the Food Poisoning Relief™ bottle did two shots and went to bed woke up a few hours later soaking wet. Showered and went back to sleep did not feel real great today just took it easy at home. I did a second hit of FPR this morning. I think the FPR saved a real bad one from occurring. My family took it with us on a trip to Port-au-Prince (the capital of Haiti). My husband and I both ate a salad at a hotel there and both were immediately so sick. We grabbed the tonic and gave it a shot and both of us felt 100% better within an hour or so. It was amazing! I have always wondered how we can get more of this! Thank you!!! !